Today's bento is made with lots of leftovers and little bits of this and that. The Santa Rosa Original Certified Farmers Market is open on Wednesdays and Saturdays, and I usually start running low on ingredients right before the next market day. In the larger container: penne pasta mixed with green garlic from the farmers market, tasso ham from Franco Dunn, red bell pepper, onion, broccoli, and some leftover chicken drumstick. I tossed the pasta with a mixture of shoyu, lime infused olive oil, mirin, sugar, and freshly ground black pepper. YUM! In the smaller container: slices of pepper jack cheese, a tangerine, and little crackers. 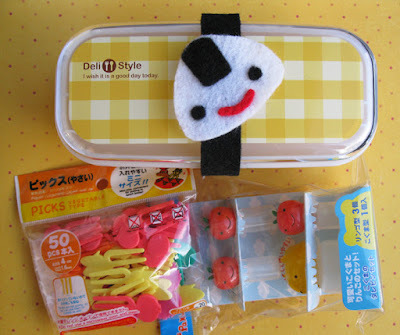 One of the items I put up for the Bento4Japan auction on eBay sold today! Woohoo! This lovely bento starter kit is still up for bids. Please click here to make your bid, the auction for this set will be over in 1 day. We've raised over $1500 in one week! Find out more about Bento4Japan and how you can help by clicking here. 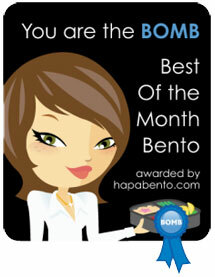 I've featured today's bento in Shannon's What's For Lunch Wednesdays blog. Check out more fun lunch ideas on her blog! 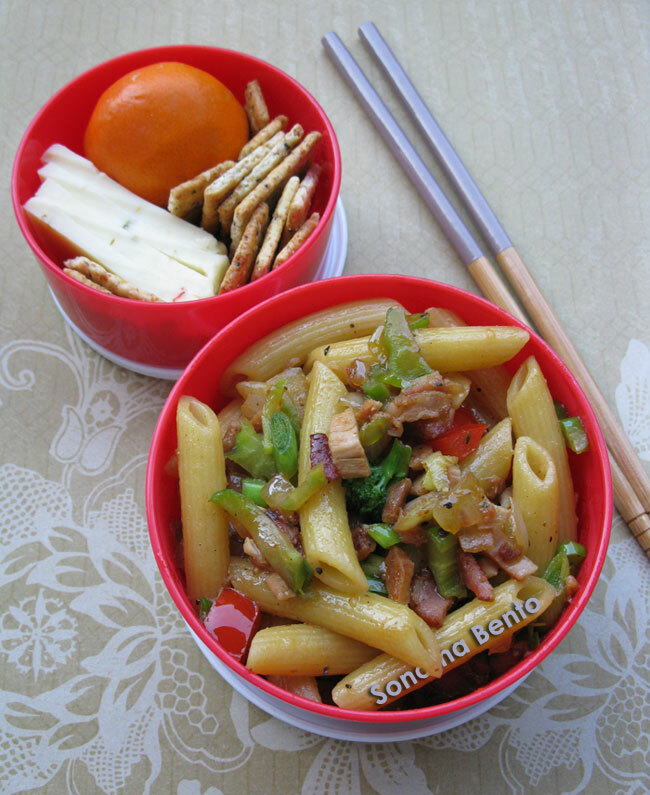 Yummy pasta bento! It sound like it's so good even when it's cold. Perfect for lunch! The pasta looks really good! I like the chopsticks with the background too. 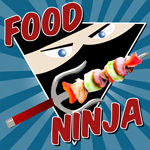 Really excited about the success of Bento4Japan too! Hi babykins! Cold pasta is really good in bento! And I am so glad you are safe. We are honored to do whatever we can to help you and your country. Thanks sheri! Bento4Japan is going sooo well! Your leftover bento looks so delicious! I love using leftover too for my bento :). Mmmmm, yummy pasta bento inspiration here! The flavors are just lip-smacking: green garlic and tasso ham! Thanks so much Cooking Gallery! Bentos come together in a flash with leftovers, soooo easy!